Farmgirl Fare: Monday Dose of Cute: Ready to Jump into a New Week? Monday Dose of Cute: Ready to Jump into a New Week? © FarmgirlFare.com, where somebody promised you Jasper's story ages ago and then totally forgot to deliver. It's actually a fairly short story, so hopefully I'll get around to telling it soon. Meanwhile he's pretty much taken over the farm. Well, I hope the story of Jasper is 'sooner' than 'soon on the farm'. We always love to read about your wonderful farm animals and how they came to live with you. Thanks, Susan, and have a beautiful week! Read Bread Alone......couldn't put it down! It gave me the confidence to try my luck at making a couronne yesterday. Used her recipe from the book (made a huge pile of dough), watched a few videos, incorporated all that and voila! I was so proud of that "crown" sitting on my counter. Enough for a separate loaf as well. Thank you for the book suggestion. Jasper seems to be one awesome cat! 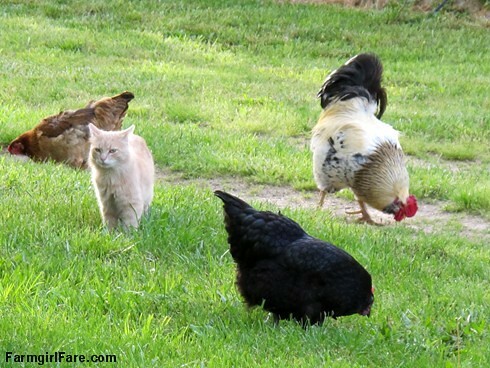 I can't believe he is able to wander amidst the chickens without ever being tempted to stalk/chase them. I guess he takes his "Jr. Stock Cat" job seriously! He and Bert are quite the photogenic duo.